The Common Redpoll (Carduelis flammea) is a handsome little finch with a raspberry-red forehead ("flammea" or flame-like) and a black chin. In winter it occasionally visits bird feeders in the northeastern United States and the Great Lakes. Especially in years of poor spruce and birch seed production, Common Redpolls may migrate as far south as North Carolina and Colorado. The redpoll acquires its bright head and pink breast in its second year and, unlike the related American Goldfinch, the Redpoll loses little of its color in fall and winter. Redpolls are extremely agile, foraging upside-down on seed-heads of tall weeds, twittering almost constantly interspersed with a dry, ascending trill. The Common Redpoll breeds in Arctic Alaska, Canada and Greenland and is a wintering bird in the remainder of Alaska and Canada, and the northeast U.S. and the Great Lakes region; the bird migrates as far south as North Carolina on a roughly two-year cycle. The Purple Finch is distinctly larger overall, and the raspberry-red color extends over the entire head to the nape. The Pine Siskin shows no red at all; it is brown-streaked and has yellow patches in the wings and tail. The Hoary Redpoll is much whiter ("hoarier"), especially in the face and flanks, and it is a rare visitor south of the Canadian border. 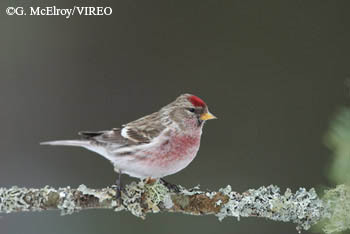 The Common Redpoll nests in low birches and willows in the Arctic tundra. It spends more time foraging low down in the tall weeds than other finches. The Redpoll's feathers, metabolism and feeding habits allow this little finch to survive winter temperatures in Alaska as low as -54 degrees F.